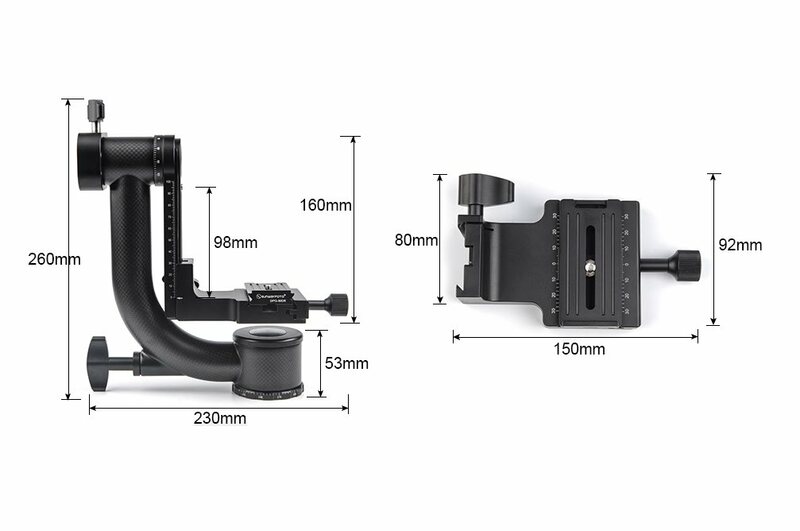 Sunwayfoto have finally released their GH-01 heavy duty Carbon Fiber Gimbal head which we saw in the Sneak Peek of Sunwayfoto Heavy Duty Carbon Fiber Gimbal Head last August. The final product has been improved and reinforced at many points. Nonetheless, some changes are obvious, while others are invisible to the end user. In any case the overall stability and balancing were improved. The most obvious change, is something I had requested and comes out very nice and is the lens cradle clamp (or L clamp as called by Sunwayfoto), which has been elongated and reinforced. Now longer lens feet as well as less usual combinations of lightweight camera with heavy lenses or vise versa; can be balanced more easily and clamped more securely. Other changed concern the addition of safety stop screws at both ends of the vertical arm, in order to prevent the cradle from falling off when loosened. Sunwayfoto GH-01 Gimbal Head on the Sunwayfoto T2C40C CF Tripod. Detailed dimensions of all parts are displayed below with emphasis to the obviously enhanced quick release clamp. 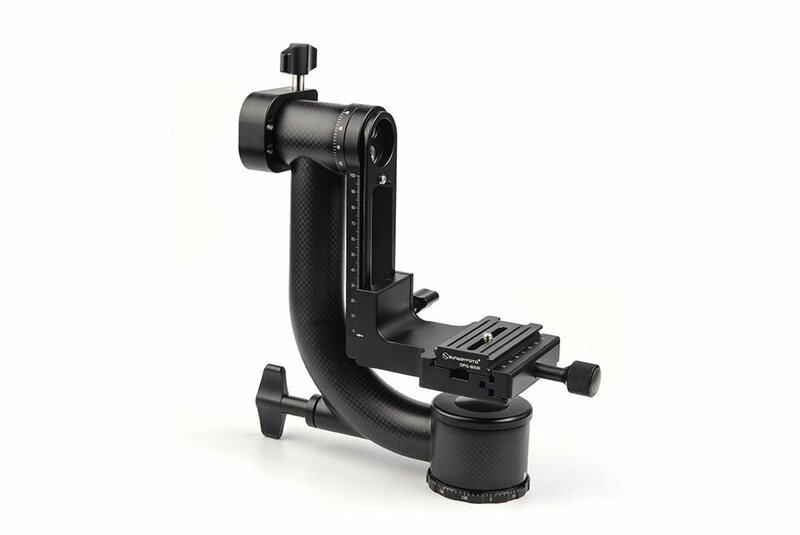 As I had said in the pre-production model preview, the GH-01 is a robust structure with a large and wide panning base which gives multi-point support to a thick J arm made of carbon fiber. The upper tilting rotator, the swinging arm, the lens cradle and all knobs are CNC machined from high density Aluminium. Precision and quality fitting all over without any plastic or rubber parts whatsoever. Nonetheless, a full test of the final production model is planned. So keep tuned. As I have already mentioned many times, the most important part in the design of a high quality Gimabal Head is to allow for absolute balancing. It is imperative that a camera combined with a long and heavy lens can be balanced on its center of gravity. 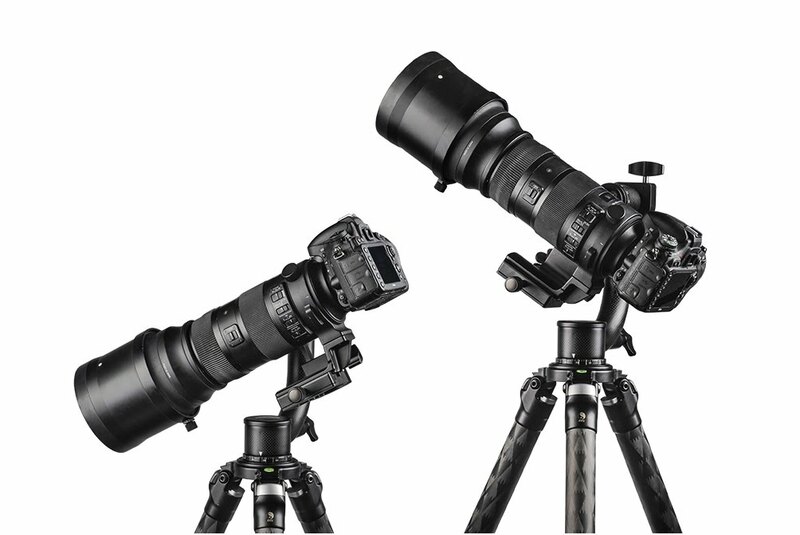 Sunwayfoto GH-01 Gimbal supporting a Nikon camera and large telephoto lens. 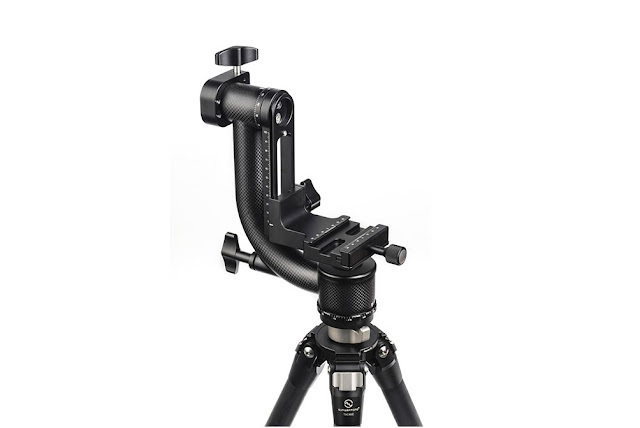 In this way it will be able to move freely in all directions being able to follow a moving subject with fluid and smooth motion.Yet stay put in any position without the need to tighten the head knobs. Sunwayfoto GH-01 Gimbal wiht Nikon camera and large telephoto lens in tilted positions. The GH-01 comes in a padded nylon case with pre-cut foam for the head parts and accessories. The Gimbal Head is accompanied by a 80 mm long lens plate with ridge and 4 M3 safety screws with the appropriate size Allen wrench. 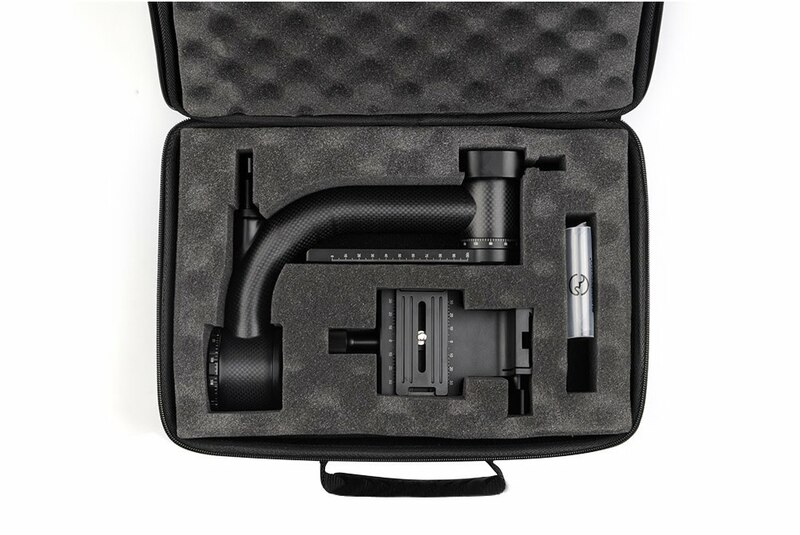 Sunwayfoto GH-01 Gimbal comes in padded case. 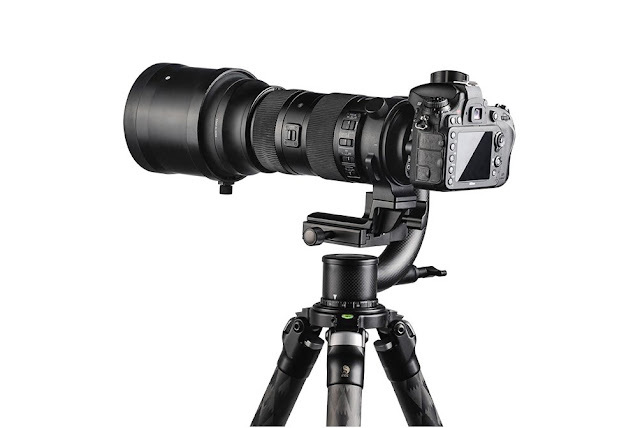 The Sunwayfoto GH-01 is designed primarily as a Gimbal Head, which can carry and balance heavy loads of large telephoto lenses giving them the ability to tilt and swivel following fast moving objects. However, there is a provision of degree scales in both horizontal and vertical plains. A full 360° scale for horizontal panning and a +/- 180° scale on the vertical tilt arm. Since the cradle clamp, that holds the lens foot is centered above the horizontal panning axis, then after centering the lens also with the vertical tilting axis you can use the head to shoot panoramas with a telephoto lens. Considering, the long range of telephoto lenses there is no need for parallax correction. If you still want to use a telephoto lens to shoot closer, then you can adjust the lens by its foot plate within the cradle clamp. Of course you might need extra long lens plates with some telephoto lenses, mounted backwards, as their NPP (Non Parallax Point / Nodal Point) is found behind the lens mount. If on the other hand you want to shoot panoramas with wide angle lenses, you should better invest in a more compact and absolutely more versatile Panoramic Head like the Sunwayfoto CR-3015 or CR-3015A Medium Size Panorama Heads, which are designed exactly for this purpose. In addition, it is less expensive. If anyone needs any more clarifications, please ask in the comments below.